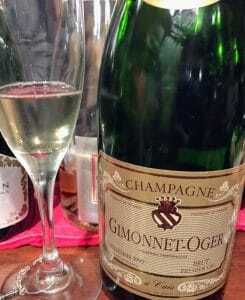 A few quick thoughts on the 1999 Gimonnet-Oger Premier Cru Champagne from the village of Cuis. The Gimonnet family has been growing grapes in Champagne since the 17th century and there are several Gimonnet estates today making wine in the Côte des Blancs. The Pierre Gimonnet branch, which David White notes in But First, Champagne dates back to 1750, is probably the most well-known. One of the Gimonnet brothers married a daughter from the Gonet family to establish Champagne Gimonnet-Gonet. The origins of Gimonnet-Oger branch dates back a little further to 1650 with Allen Meadows of Burghound noting that its proprietor, Jean-Luc Gimonnet, is a cousin to the neighboring owners of Pierre Gimonnet. Jean-Luc tends his family’s 9 ha (22 acres) of vines in the premier cru village of Cuis. Like Krug, he conducts primary fermentation in oak barrels. Gimonnet favors long aging on the lees (sometimes a decade-plus) before disgorging. The wines are bottled with dosages in the 5-7 g/l range. The 1999 vintage is a 100% Chardonnay that spent 12 years aging on its lees before disgorging. There is a strong green apple note in this Champagne but it is more bruised than fresh. Medium-plus intensity nose. Lots of green apples but they have more of an oxidative bruised component than fresh one. There is also a strong streak of pastry almond like marzipan. On the palate, the bruised apples comes through but feels a bit livelier with racy high acidity. The acid also highlights some lemon citrus peel as well. Very creamy mouthfeel with a moderate mousse. Short finish drops quickly with mostly the acid edge lingering. At $150-170, you’re paying for the low production of this small grower and its extended aging. I haven’t had many experiences with Gimonnet-Oger but my instinct is that this 1999 is probably past its prime and is not worth seeking out. It is possible that a younger vintage may have more to offer but right now there are better values from other growers and houses. Tagged Allen Meadows, Burghound, But First, Champagne, Chardonnay, Côte des Blancs, Cuis, David White, Gimonnet-Gonet, Gimonnet-Oger, Grower Champagne, Jean-Luc Gimonnet, Krug, Pierre Gimonnet, Premier Cru Champagne.